There’s always something to be said for sticking with your camera manufacturer’s own lenses, especially at the top end of the quality range. However, Tamron is now making lenses that offer similar quality at more affordable prices, and this is a great standard zoom lens for full-frame photographers, at a bargain price. What price a top-flight standard zoom? Canon and Nikon shooters upgrading from an APS-C format body to a full-frame model face a hefty extra bill for the latest own-brand 24-70mm f/2.8 lenses, at around £1,730/$1,750/AU$2,400 and £2,000/$2,400/AU$3,050 respectively. And neither is perfect for general shooting; the Canon lens lacks image stabilization and the Nikon is comparatively massive, mostly due to the fact that the physical length remains fixed throughout the zoom range. Tamron has a long history of manufacturing ‘budget’ lenses that offer decent build quality and performance but can’t really compete with the best glass on the market. That’s changed recently, with the advent of G2 (Generation 2) editions of the company’s 24-70mm and 70-200mm f/2.8 lenses, which aim to match or even beat camera manufacturers’ pro-grade lenses while still undercutting them for price. Upgrades over the original Tamron 24-70mm f/2.8 include a new optical path that aims for impeccable image quality. High-grade components include two XR (Extra Refractive Index), three LD (Low Dispersion) and three GM (Glass-Moulded aspherical) elements, plus a hybrid aspherical element. Nano-structure and regular coatings are combined to keep ghosting and flare to a minimum, and the front element has a muck-resistant, easy-clean fluorine coating. The autofocus system is revamped for extra speed and accuracy. Being a ring-type ultrasonic system it’s typically quiet as well, and comes complete with the usual manual override. Whereas the Canon lens has no stabilization and the Nikon has a 4-stop stabilizer, the Tamron has ‘best in class’ stabilization with a 5-stop CIPA rating. The Tamron G2 ticks all the right boxes for a professional-grade standard zoom lens. It’s sturdily built with a metal outer barrel and a full set of weather seals. As with the Canon lens, it stretches in physical length as you extend the zoom setting, but that enables it to be reasonably compact for carrying. At 905g, the Tamron weighs 100g more than the Canon lens, but is 165g lighter than the Nikon. The zoom and focus rings operate smoothly and enable accurate, precise adjustments. There’s no hint of zoom creep, but a zoom lock switch is fitted anyway. As you’d expect in this class of lens, a focus distance scale is mounted beneath a viewing window, and the lens is supplied complete with a petal-shaped hood and soft pouch. Sharpness and contrast are excellent throughout most of the zoom range, and at most apertures. Sharpness across the frame is impressive when shooting wide open at 24mm, although you'll need to stop down to f/5.6 if you want optimum sharpness right into the corners; doing so also eliminates vignetting, which is rather noticeable when shooting at 24mm and f/2.8, although no worse than in the pricier Nikon lens. Center sharpness drops off a bit towards the long end of the zoom range when shooting at f/2.8, but the upside is that bokeh is wonderfully smooth and soft. This makes the Tamron excellent for portraiture, where it won’t accentuate every tiny blemish in skin, while giving a delicious blur to the background. Color fringing and distortions are pretty minimal, and resistance to ghosting and flare is very good. In our tests, the autofocus system lived up to its claims for accuracy and speed, while the VC (Vibration Compensation) system is one of the best we’ve used. In terms of image quality compared to the latest own-brand Canon and Nikon lenses, the Tamron fares well. It matches the Canon for center-sharpness throughout most of the zoom range, and is only slightly worse at the long end, while actually beating it for corner-sharpness in the 24-35mm sector. For other facets of image quality, the Tamron and Canon are very similar. The Nikon edges ahead for sharpness, but the Tamron fights back with better performance in terms of color fringing, distortions and wide-aperture vignetting. There’s always something to be said for sticking with your camera manufacturer’s own lenses, especially at the top end of the quality range. 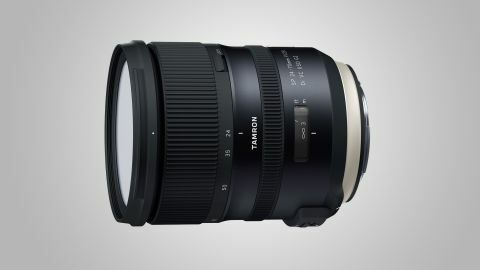 However, the likes of Tamron and Sigma are now making lenses that offer similar quality at more affordable prices. Indeed, this Tamron is also up against the Sigma 24-70mm f/2.8 DG OS HSM | Art lens. For build quality, handling and performance there’s almost nothing to choose between the Tamron and Sigma, but the Tamron is a little less expensive to buy, so it wins out on value for money. More significantly, the Tamron 24-70mm G2 holds its own against its more expensive Canon and Nikon rivals. All things considered, this is a top-class standard zoom lens, and a bargain at the price.